Mandarin Chinese Voice Prompts for Asterisk, AsteriskNow, Trixbox, Callweaver, Elastix & FreePBX. All sound recorded by native speaking voice artists. 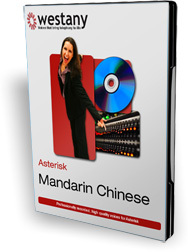 Entire set of Mandarin Chinese voice prompts for Asterisk, AsteriskNow Trixbox, Callweaver, Elastix and FreePBX. By allowing Mai to handle your calls you get a professional sounding business voice with the accent and intonation to match. Mai contains all the voice prompts for each of the six major Asterisk PBX platforms. Namely Asterisk, AsteriskNow, Trixbox, FreePbx, Elastix and Callweaver. If there’s a feature that needs a voice prompt, then we have it in the product. Every single feature from Automated Attendant, to voicemail, from IVR, to CTI, from Time and Date, to Call Monitoring, from Call Queuing, to Calling Cards, from Call Forward on Busy, to Caller ID on Call Waiting.